36 months or 36,000 miles / 58,000 kilometers, whichever comes first when traveling more than 25 miles / 40 kilometers from the original TECHNET PROFESSIONAL AUTO SERVICE® repair facility. 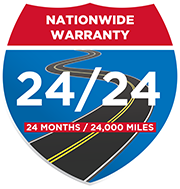 Download the full Nationwide Warranty and coverage information here. We’ve made it easy for you to receive help anytime, day or night, with flat, lost keys, empty tanks, and a dead battery or need for a tow. 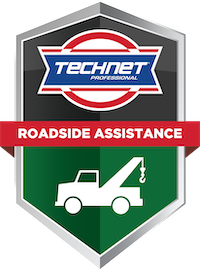 The Roadside Assistance Program from TECHNET PROFESSIONAL AUTO SERVICE® centers offer 365 days of 24/7 roadside assistance and is complimentary with your qualifying service. When you purchase $25 or more in service from a TECHNET PROFESSIONAL AUTO SERVICE® center, you’re covered for 365 days when you need a tow-to-safety, lock-out aid, battery jump start, emergency fuel delivery, or flat tire changing assistance. The Program benefit is limited to the reimbursement of two (2) roadside assistance incidents for any covered services per Coverage Period per Covered Vehicle, up to a maximum eligible reimbursement amount of one-hundred and fifty ($150.00 USD) dollars per disablement (the “Benefit Limit”). If you need roadside assistance contact the service provider of your choice. Simply pay them for the service, and submit the required claim form and invoices, and you will be reimbursed for eligible services received. Don’t forget to include our toll-free Roadside Assistance phone number (866-588-0728) in your cell phone to access the Roadside Assistance program dispatch anytime day or night 24/7. Download the full terms and conditions of the Roadside Assistance Program.